Softwood flooring denotes a pine-needle bearing tree and is typically softer than hardwood, a leaf-growing tree. One of the more common types of softwood flooring is Southern Yellow Pine, slightly harder than some of the other pines. Douglas Fir is another fairly common type of softwood flooring. Southern Yellow Pine is available as an unfinished floor. It is tongue and grooved much like Hardwood flooring and generally milled to 3/4. It is typically available in multiple widths, such as 4”, 6” and 8”. Typical lengths will be random from 6′-16′. 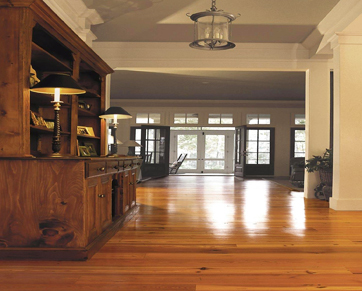 Wide pine flooring can also be found dressed on all four sides but not tongue and grooved. Examples of this type of flooring are White Pine and Radiata Pine.